I've just started a massive cleaning/purging of my house, which is badly needed. I'm not to the point where I need to call in a cleaning show, but it's not great either. I'm trying to be relentless when throwing and donating and selling, but it's hard. Things of sentimental value that are just clutter...what does one do with them? I know they are not the person and not the memory. But I also don't want to end up in a house full of clutter and trash either. 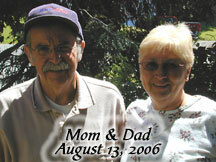 I made the hard decision to throw out the roses from my dad's memorial service. I have two vases that the flowers were in, and those are useful (and used). My friend, who is helping, took a few petals and saved those in a shadow box with a butterfly picture because she thought I should have kept them. 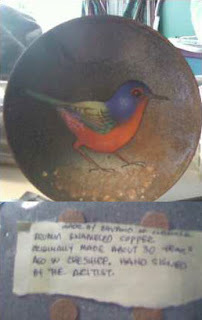 I found a little decorative plate my dad gave me, with a bird on it. For some reason I turned it over. And there was a note on the back. Obviously it's always been there and maybe I read it before, but it surprised me to see my dad's handwriting. There is nothing overtly affectionate in the note, which says: "Made by Bavano of Cheshire. Brumm enameled copper. Originally made about 30 years ago in Cheshire. Hand signed by the artist." It's the thought behind it, that not only did he buy me this pretty little bird plate, but he took the time to write down its history. That's how my dad showed affection, he didn't go around hugging and kissing people or leaving mushy notes. Do I need this plate? It is not useful. It is clutter. It is a dust catcher. But it's cute. And it has a note from my dad on the back. And since I had the note, I looked up the company. I think it's Bovano. There is nothing like this plate on their website but it seems to be a similar process. My dad put notes on everything. We love reading them. I found a note that said "Love from this Mean old man". It was to mom and me.Don't remember when or why he wrote it but I like finding it. You definitely have to keep the plate! How nice to find little notes like that. I love your blog. My dad has Alzheimer's and so your title caught me right away. I started my own blog last month, but can't figure out how to get it on google. I'm not very tecky. would love some help if you have the desire or time. It's yournameisjack.blogspot.com. thanks in advance for any ideas. seriously, thanks for making me laugh and cry with your writing. you inspired me. I love your post. I worked with a woman once who said she labled all her china with information on the back. I didn't completely understand why, until now. I'm from Italy, my mum has Alzheimer's ..I was just looking for .. something. People, stories, information, support .. whatever.